Success in laser hair removal is typically reported in terms of permanent hair elimination or in terms of marked delay in its growth. Most investigators have assessed patients with light skin types (ie, Fitzpatrick skin types I-III), but more recent groups have studied newer lasers for Fitzpatrick skin types IV-VI. Goldman et al first described ruby-laser injury to pigmented hair follicles in 1963. In 1983, Oshiro and Maruyama noted hair loss from nevi after treatment with a ruby laser. However, at fluences affecting hair follicles, the epidermis was severely damaged. The theory of selective photothermolysis that Anderson and Parrish developed in 1983 was based on a laser of particular wavelength and a pulse duration of light to target a particular chromophore. By applying this theory, the target can be destroyed selectively, sparing the surrounding tissue. Use of a topical suspension of carbon particles followed by treatment with a Q-switched neodymium-doped yttrium aluminum garnet (Nd:YAG) laser was the first laser treatment for hair removal the US Food and Drug Administration (FDA) approved. This initial method reportedly delayed regrowth by 3 months, but it did not provide permanent hair reduction. Initial laser systems, such as the Q-switched Nd:YAG (1064 nm, Soft Light system; Thermolase Corp, San Diego, CA), used a suspension of carbon mineral oil to penetrate the hair follicle and to act as an energy-absorbing chromophore. An optically filtered xenon flashlamp (Epi Light, ESC Luxar; Energy Systems Corp, Needham, MA) uses filters to select operating wavelengths of light at a cutoff of 690 nm, allowing light above this wavelength to pass through to affect hair. The long-pulse ruby laser (EpiLaser 694 nm, Palomar Technologies, Lexington, MA; EpiTouch, Sharplan Laser, Allendale, NJ) uses the principle of selective thermolysis in which melanin acts as the target chromophore. Most technical improvements in laser devices have been incremental in terms of improving efficacy and reducing side effects. Some new models combine light- and heat-based methods by using radio-frequency (RF) energy; these are based on the theory that the heated areas can be further heated without causing damage to surrounding skin. New devices are frequently introduced, and old models may be discontinued but still available as after-market products. Check with the manufacturers for latest information. Unwanted pigmented hair is a common cosmetic problem for both men and women. About 4% of young, healthy randomly selected white women feel disfigured by their facial hair. The percentage is even higher in people of color and increases with age. This percentage does not reflect the vast number of patients who have unwanted hair in other areas, and it does not account for the huge number of men who feel disfigured by unwanted hair (eg, on the ears and back). Excessive hair growth affects the healthy population, but it also severely affects patients with hormonal disturbances, such as polycystic ovary disease, congenital adrenal hyperplasia, hirsutism, hypertrichosis, and congenital hairy nevi. Excessive hair growth has been implicated in the pathogenesis of pilonidal disease and in the unfavorable outcome of some reconstructive flaps. Hirsutism is characterized by the excessive growth of coarse terminal hairs in women in a pattern similar to that of adult men. Given the subjectiveness of this perception, especially in different racial groups, Ferriman and Galway developed a scoring scale. Nine body areas are used to grade hair growth on a scale of 0-4. The scores for the 9 body parts are added, and a total score of 8 or more defines hirsutism. On the basis of this scale, 5% of women in the United States have hirsutism. Hyperandrogenism (ie, increased plasma androgen levels) is sometimes the cause. This condition may be related to adrenal causes (eg, congenital adrenal hyperplasia, androgen-producing tumors), pituitary causes (eg, Cushing disease), ovarian causes (eg, polycystic ovary disease, ovarian tumors), or exogenous causes (eg, anabolic steroids, testosterone). Idiopathic hirsutism is likely caused by subtle forms of ovarian or adrenal hypersecretion, alterations in serum androgen-binding proteins or androgen metabolism, or (most likely) excessive genetic sensitivity of hair follicles to normal androgen levels. Patients typically have a history of either excessive hair growth or hair growth in undesired body locations. For men, these areas are often the shoulders, back, and ears. For women, these areas are often the face, breasts, legs, and lower abdomen. Take a complete history, including menstrual, pregnancy, and family histories. Discuss the degree of past, recent, and potential future sun exposure. Perform a full external physical examination. If a hormonal problem is suspected, consider referring the patient to an endocrinologist or a gynecologist. The indication for hair removal is mostly subjective. A desire for hair removal is the only criterion for laser surgery. Each hair has 3 distinct components: the bulb, which lies near the insertion of the erector pili, the isthmus, and the infundibulum. 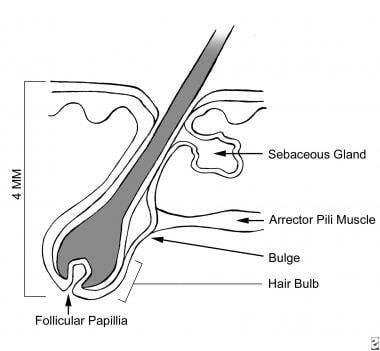 Pluripotential cells in the bulb and bulge areas cause growth of the hair follicle. Melanocytes are present in these areas. For most people, the bulb is approximately 4 mm beneath the surface of the skin (deeper in some individuals). Therefore, a considerable laser-penetration depth is required to remove the bulb. Hair grows in cycles. Anagen is the active growth phase, catagen is the transition phase, and telogen is the resting phase. The duration of the anagen phase governs the length of hair at different body sites. Lasers are truly effective in only the anagen phase, when hair-matrix cells divide rapidly and migrate outward from the shaft and when the melanin load is at its highest. During the catagen phase, mitosis ceases, the hair matrix regresses, the papilla retracts to a place near the bulge, and capillary nourishment diminishes. In the telogen phase, the follicle detaches from the papillae and contracts to a third of its original depth, eventually falling out. The telogen phase varies in duration from one body area to the next. For example, the telogen phase may last as long as a year for hair on the leg. The ratio of anagen follicles to telogen follicles varies with body location. Because not all of the hairs are in the anagen phase at any 1 time, laser treatment must be repeated to capture the new hairs coming into the anagen phase. For the laser to be effective, the hair pigment must be darker than the surrounding skin pigment. If this is not the case, the treatment will not work, and harmful complications may occur. Early in the evolution of the procedure, patients with Fitzpatrick skin types V or VI were not candidates, and even patients with skin types III and IV were at high risk. With new technologies, most patients can now be treated, though caution must still be exercised. Recently, Aldraibi et al looked at using topical corticosteroid treatment to help minimize the side effects when treating skin types IV-VI with an Alexandrite laser system. Their study showed that using a topical corticosteroid treatment appears to minimally help in reducing posttreatment erythema and edema and also decreases the duration of hyperpigmentation. It was felt in this study that treating skin type VI was "less safe." Sun tanning is obviously contraindicated during or before treatment because the practice darkens the pigment of the skin surrounding the hair. Goldman L, Blaney DJ, Kindel DJ Jr, Franke EK. Effect of the laser beam on the skin. Preliminary report. J Invest Dermatol. 1963 Mar. 40:121-2. [Medline]. Ohshiro T, Maruyama Y. The ruby and argon lasers in the treatment of naevi. Ann Acad Med Singapore. 1983 Apr. 12(2 Suppl):388-95. [Medline]. Grossman MC, Dierickx C, Farinelli W, et al. Damage to hair follicles by normal-mode ruby laser pulses. J Am Acad Dermatol. 1996 Dec. 35(6):889-94. [Medline]. Dierickx CC, Grossman MC, Farinelli WA, Anderson RR. Permanent hair removal by normal-mode ruby laser. Arch Dermatol. 1998 Jul. 134(7):837-42. [Medline]. Gan SD, Graber EM. Laser hair removal: a review. Dermatol Surg. 2013 Jun. 39 (6):823-38. [Medline]. Bernstein EF, Basilavecchio L, Plugis J. Bilateral axilla hair removal comparing a single wavelength alexandrite laser with combined multiplexed alexandrite and Nd:YAG laser treatment from a single laser platform. J Drugs Dermatol. 2012 Feb. 11(2):185-90. [Medline]. Uyar B, Saklamaz A. Effects of the 755-nm Alexandrite laser on fine dark facial hair: Review of 90 cases. J Dermatol. 2012 Jan 10. [Medline]. Ibrahimi OA, Kilmer SL. Long-Term Clinical Evaluation of a 800-nm Long-Pulsed Diode Laser with a Large Spot Size and Vacuum-Assisted Suction for Hair Removal. Dermatol Surg. 2012 Mar 27. [Medline]. Helou J, Soutou B, Jamous R, Tomb R. [Novel adverse effects of laser-assisted axillary hair removal.]. Ann Dermatol Venereol. 2009 Jun-Jul. 136(6-7):495-500. [Medline]. Haedersdal M, Beerwerth F, Nash JF. Laser and intense pulsed light hair removal technologies: from professional to home use. Br J Dermatol. 2011 Dec. 165 Suppl 3:31-6. [Medline]. Aldraibi MS, Touma DJ, Khachemoune A. Hair removal with the 3-msec alexandrite laser in patients with skin types IV-VI: efficacy, safety, and the role of topical corticosteroids in preventing side effects. J Drugs Dermatol. 2007 Jan. 6(1):60-6. [Medline]. Fayne RA, Perper M, Eber AE, Aldahan AS, Nouri K. Laser and Light Treatments for Hair Reduction in Fitzpatrick Skin Types IV-VI: A Comprehensive Review of the Literature. Am J Clin Dermatol. 2017 Aug 8. [Medline]. Richards RN, Uy M, Meharg G. Temporary hair removal in patients with hirsutism: a clinical study. Cutis. 1990 Mar. 45(3):199-202. [Medline]. Tremaine AM, Avram MM. FDA MAUDE data on complications with lasers, light sources, and energy-based devices. Lasers Surg Med. 2015 Feb. 47 (2):133-40. [Medline]. Ormiga P, Ishida CE, Boechat A, Ramos-E-Silva M. Comparison of the effect of diode laser versus intense pulsed light in axillary hair removal. Dermatol Surg. 2014 Oct. 40 (10):1061-9. [Medline]. Sand M, Bechara FG, Sand D, Altmeyer P, Hoffmann K. A randomized, controlled, double-blind study evaluating melanin-encapsulated liposomes as a chromophore for laser hair removal of blond, white, and gray hair. Ann Plast Surg. 2007. 58(5):551-554. [Medline]. Chuang GS, Farinelli W, Christiani DC, Herrick RF, Lee NC, Avram MM. Gaseous and Particulate Content of Laser Hair Removal Plume. JAMA Dermatol. 2016 Dec 1. 152 (12):1320-6. [Medline]. Absorption spectrum of melanin and oxyhemoglobin. Laser hair removal has not been available long enough to permit a full assessment of its long-term health effects. At this time, short-term data indicate that laser hair removal is generally safe. Because studies have shown that laser hair removal can alter skin structures such as sweat and oil glands, they may cause lasting changes to the skin as adverse effects in some patients.